Water is something that our bodies need to stay hydrated, and buying bottle of water every time you need a drink is not good for the environment or your wallet. Having a water bottle that you can reuse on a daily basis is a great way to tackle this issue, but which water bottle is the best. There are so many different water bottles, and they all vary in functionality and style that it may be difficult to decide which is best for you. Everyone’s needs differ, but after thorough consideration, we have compiled a list of the top three water bottles available as well as a budget conscious option. Here’s what we came up with. CamelBak is a leading company that produces water bottles and hydration solutions today. The CamelBak Eddy is a water bottle that is comprised of a durable plastic that is both BPA-free and BPS-free. This water bottle features a wide mouth design that makes it easy to fill with ice to keep you water nice and cold. It also makes it easier to clean, since you will be able to get your hand down into the bottle to wash it. The CamelBak Eddy is a 0.75 liter container that is designed to hold enough water to rehydrate you throughout the day. The bottle itself is a simple design that will fit in most cup holders. It sports the company name at the bottom of the bottle as well as on the side of the lid. This water bottle is a sleekly designed product that will fit in at the office as well as at the gym. There are two ways to drink from this water bottle, and both ways work well to keep you hydrated. The first is the bite and sip method that utilizes a straw. Simply press down on the silicone valve to drink by way of a relatively fast flow that is pushed through the straw. The second method is a pour and squirt method that removes the straw completely. Simply tip the water bottle like you would a cup to release the water through the valve. Whenever the valve is locked in the downward position, it creates a completely spill proof seal. Water even has a hard time dripping through the bite valve when it is closed. If you really want to assure that your water bottle provides you with a cold drink, the durable plastic is capable of being frozen, just make sure that the liquid inside is only filled about three fourths full. The CamelBak Eddy is available for purchase on Amazon for about $15, and as previously stated, it comes with a lifetime warranty. This water bottle is available in a myriad of colors, including unique options such as acai, African violet, cardinal red, charcoal grey, chili red, dragon fruit, grass green, hunter green, lava, navy blue, palm green, rain, royal lilac, strawberry, and oxford blue. Some of the variations have matching lids, while others offer a grey option for a bit of color variation. Pogo is a company that takes hydration to a new level by combining sporty design with portable functionality. Our silver pick, which is the Pogo Plastic Water Bottle, is a water bottle that is designed with a stylish look that is compact and easy to fit in your purse, bag, or backpack. The bottle is a 32 ounce container, which is clearly indicated on the water bottle in case you forget. The bottle also sports the Pogo logo at its base. One functionality that is great with this Pogo water bottle is the measure lines that are on the outside of the bottle itself. This feature makes it so that you can easily know exactly how much liquid you have in the bottle as well as a way to tell how much to place in the bottle when you are mixing different flavored drinks like tea and lemonade. It has a measure line at eight ounces, 16 ounces, and 24 ounces for your convenience. The bottle is crafted from a Tritan construction that is both BPA and BPS free. It features a chug style lid that flips into place and locks tightly when not in use. This lock creates a seal that is spill proof so you need not worry about placing it in your bag next to your laptop. It also features a wide mouthed rim, which is great for adding ice to your drink, refilling it, or simply taking a larger drink directly from the rim. This Pogo water bottle is designed to be hand washed with ease because of the way it is shaped; in addition, it is also dishwasher safe. Make sure to place the bottle on the top shelf of the dishwasher. Never clean this water bottle with abrasive materials that could cause unwanted scratches in the surface, and remember that this bottle is designed for cold liquids, so do not attempt to heat your drink up in the microwave inside of this water bottle. The lid of the bottle is fully covered with a carrying loop that is attached to the lid. This makes it easy to carry in your hands during a hike, or you can simply connect it to your backpack as you hike the trail. If you prefer a smaller water bottle, Pogo also offers this style in other sizes that may accommodate you better. When it comes to reviews, the ones on Amazon are above what you would expect. An incredible 92 percent of the users who reviewed this water bottle gave it a four star rating or above, and 80 percent of them gave it an exceptional five star review. The testimonials are almost all positive, and an overwhelming number of the reviewers happy with their purchase. One reviewer gave it an amazing testimonial saying how much great the water bottle is when it comes to tracking your daily water intake. Many other reviewers have expressed how much they like the flip top spout, which makes this water bottle really easy to drink from when you need to rehydrate quickly. This 32 ounce Pogo water bottle can be purchased on Amazon for about $9, which is a great, low price point for something that you will quite possibly use every day. It is available in four color variations, which are grey, pink, purple, and blue. If you like to drink water instead of sipping it through a straw, then our bronze pick is the perfect option for you. The OXO Good Grips Water Bottle is a portable water bottle that is durable enough to stand up to daily wear and tear. The bottles are constructed from a BPA-free Tritan material that holds up to 24 ounces of water. The exterior of this OXO water bottle has a slim stylish design that is great for work, at the gym, or any place else where you might need extra hydration. The slim design is the perfect size for any cup holder, including the water bottle holder on your bike. It even has a stainless steel tether that attaches the bottle directly to the lid, which provides you with a convenient location to carry it from. This loop is big enough to carry the water bottle in the crook of your finger as well as by a hook that is attached to your backpack. When the lid is not closed on this water bottle, the tether serves as a method of keeping the lid connected to the bottle. The lid of this water bottle is unique. It can be opened in two different ways. To refill it, the lower most part of the lid must be unscrewed, which is easily wide enough to add a few pieces of ice to your drink, add a slice of lemon to your water, or clean the water bottle with ease. The wide mouth of the bottle is great for quickly filling it up, but the smaller rim is perfect for rehydrating on the go. The drinking spout is smaller than the rim of the bottle, but it is bigger than a straw that may come with other water bottles. It provides you with the perfect sized opening to better control how much water is released when you take a drink. The side of the bottle features measurement markings to keep track of your daily water intake. It can also be used to measure out protein drinks for the gym, or lemonade on a hot summer’s day. These measurement markings are in both ounces and milliliters, so you can easily measure any liquid throughout the day. The OXO water bottle is easy to clean, especially since it is dishwasher safe. Make sure to place the bottle on the top shelf to avoid unwanted damage, and try to avoid putting hot liquids in the bottle, as it is designed for cold refreshments. This OXO water bottle can be purchased on Amazon for about $15, and it comes in a variety of colors. Red, orange, pink, cobalt blue, charcoal grey, emerald green, glacier blue, and olive green are among some of the more vivid options, but it can also be purchased in a clear option as well. Nalgene has been creating quality water bottles for over 20 years, so it is no surprise that we would put them on our list. They also create water bottles that have a low price tag, so the Nalegene water bottle has been named our ballin’ on a budget choice this time around. The bottle is made from a BPA-free Tritan material that is designed to be durable. It is resistant to impact damage as well as extreme heat and cold temperatures. In fact, this water bottle can withstand temperatures as high as 212 degrees Fahrenheit and as low as negative 40 degrees Fahrenheit. Since this water bottle is so resistant to heat, you can easily fill it with hot or cold beverages. It can even be filled with boiling water and used to heat your sleeping bag during cold nights in the great outdoors. 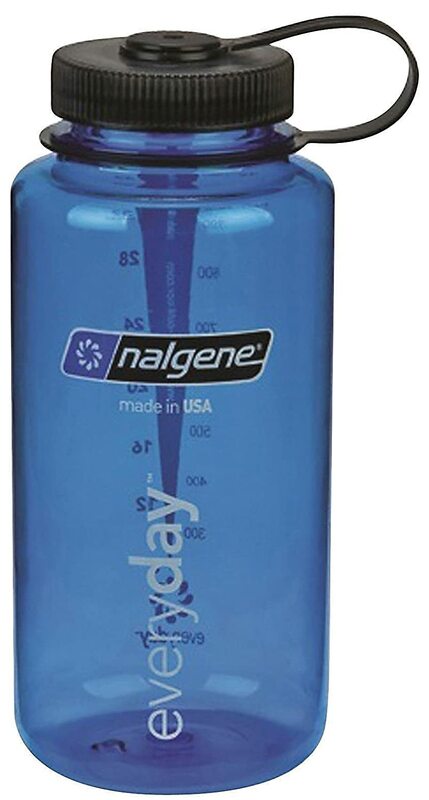 The Nalgene water bottle also features a sleek design that easily fits in cup holders and bike cages. This water bottle has a wide mouth opening, which makes it easy to fill, add ice cubes, and clean. It is also dishwasher safe, so once you are done hiking, you can put it on the top rack of the dishwasher and forget about it. The lid is connected to the bottle with a loop top design that is easy to carry. It can also be connected to a bag if you desire. Nalgene designed this water bottle so that you can easily remove the lid and drink to your heart’s desire. Most water filters fit on this bottle, so you can be assured that you are rehydrating in a healthy manner. It comes complete with a measurement guide that helps you track the milliliters and the ounces of water that you drink. It can also be a great guide for when you need to mix drinks on the go. This leak proof bottle comes complete with a lifetime guarantee, and it can be purchased on Amazon for around $11. It can be purchased in a variety of colors including: blue, clear, spring green, trout green, slate blue, purple, orange, red and pink. It can also be purchased with creative designs like hearts on the exterior or bought in a glow-in-the-dark style. 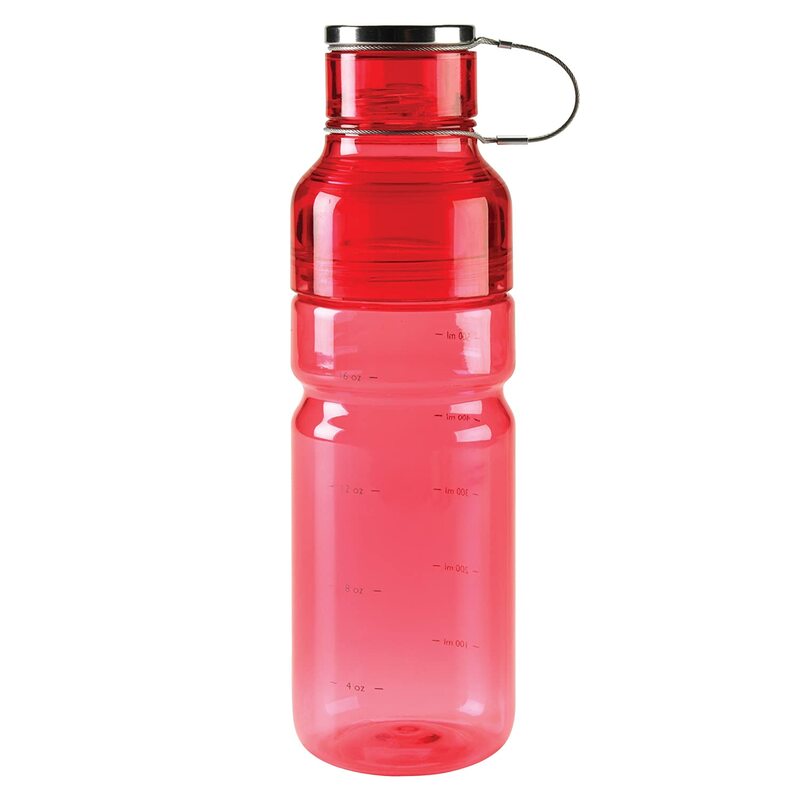 The most common material for water bottles to be made of is either stainless steel or plastic. Stainless steel options provide good insulation, so they are a great choice for carrying hot beverages. They are also typically heavier and less dent resistant than plastic water bottles, so if you hike a lot a plastic water bottle may be a better option for you. Just be aware that some plastic material contains BPA, which can seep into the beverage you have inside the water bottle. This chemical has been linked to cancer and diabetes, so it may be best to make sure your water bottle is BPA-free. You want a water bottle that is comfortable in your hand. You also want it to fit into cup holders, like those in your car, and backpack nets. If the water bottle you select is too large, you will not want to carry it. How much water do you drink on a daily basis? Make sure that the water bottle you choose holds enough water for you to stay hydrated during a long hike. Of course you can fill it up, but will there be clean water nearby when it becomes low? Most water bottles hold between 12 ounces and 48 ounces, so decide which capacity level is best for you. • Spout – This type of opening can be pulled up with your teeth when you want water. The water will flow out when the bottle is tipped, but you will often find yourself sucking on the spout to get the water more quickly. • Nozzle – This type of water release utilizes a straw. This design minimizes spills and leaks, but you may have to bite the straw to release a flow of water. This type of opening is great for runners. 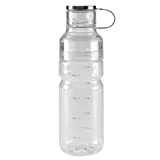 • Wide Mouth – These types typically have a screw top that you completely open and drink from the bottle directly. It allows you to easily take big gulps of water when you are extremely thirsty without the need to sip it through a straw or a spout. This type of opening is great for campers and those who enjoy hiking. Remember that you may be carrying your water bottle in your hand, so it cannot be unwieldy or cumbersome. Many water bottles have some kind or tether or loop where you can easily carry it in the crook of your finger. Another option is to use a carabiner to attach it to your backpack. When you have a water bottle that looks appealing, you will not mind carrying it with you throughout the day. Many of the water bottles on our list offer you the option of several different colors; in fact, some reviewers even indicated that they own a few different colors. IF you like to accessorize, then you can purchase the color varieties that suit your style and match them with some workout clothes to give you a stylish look at the gym. Hydration is important to us all, but buying plastic water bottles can be bad for the environment. Having a reusable option is a great way to save not only our planet, but our wallet as well. Before you take your next hike through nature, make sure to take a look at our pre-purchase considerations, consider our top picks, and decide which water bottle is best for you. Having an easy way to drink on the go is a decision you will not regret.